WASHINGTON — Bishop Barry C. Knestout quoted from Catholic author J.R.R. Tolkien to make a pro-life point during his homily at the Friday, Jan. 18 Mass that closed the Vigil for Life. 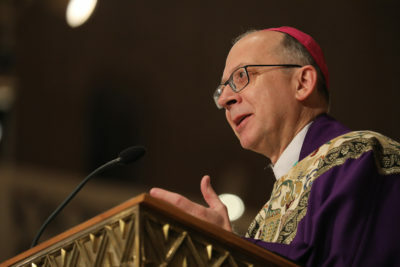 “We celebrate this Mass for Life in the city of Washington, the nation’s capital, where the pill was approved by the FDA in 1960, where the American ‘Humanae Vitae’ crisis was centered in 1968, where the Supreme Court decided that abortion was a constitutionally protected right in 1973, and where the sexual abuse and Church leadership crisis has been centered in 2018,” Bishop Knestout added.